Hi all, finally signed up. I've been watching the blog and seeing everyone else's turn out so well. I've been madly knitting but stopped to finish up some other ufos on my plate. 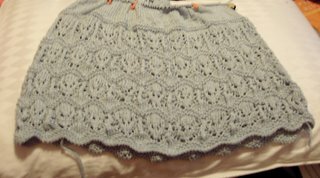 I'm a bit more than half way - having finished the 4 repeats of the lotus lace (alien heads), and I'm in the stockinette now. This was taken without my flash. The color is actually a light blue. This next one is with my flash - so you can see the color closer...Also hiding in the upper right corner are some really cute new stitch markers I found on ETSY.com (Search for "Sheep stitch markers" and you'll just fall in love with them. I'm using Madil Eden (Cascade's Bamboo) and making the smallest size. A local store near me had knit it in the off-white color and let me try it on. Even though I am between the smallest and next smallest size, it fit me perfectly (expanded to fit!). I hope mine turns out just as well. I do plan to add about a half inch in the stockinette part, so that part will extend over the bottom of my bra. The bamboo has more drape than cotton, or the SWTC bamboo, and it hasn't split much, of course, I knit sl-o-o-o-wly through the lace part, so I was careful not to split it. 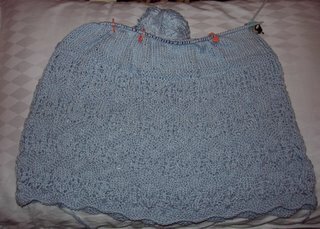 Now, I hope I can knit it quick enough to catch the end of summer. Wow - I never noticed before, but they ARE alien heads! That looks great! How did they modify the bust to fit at your yarn store? I'm knitting the smallest size as well and am curious how to make the bust a bit more fitted. The shop did not modify the bust. The Madil Eden has more drape knitted up than the SWTC bamboo. I was amazed. When I tried it on, it just draped over me and expanded to my bust size, and over my hips. The one thing is that I estimated needing an extra 1/2" stockinette to go over the bottom of my bra. Set flat on a table, I measured the width of the lace repeats, and it matches the pattern - some 33" (sorry don't have it with me at the moment), but it expands a bit when it settles on me. So, I am expecting not to have to do any short rows with this yarn. If you are using the yarn in the pattern, you may have to do short rows (read over the past posts). Also, I just had a rude awakening. While I was knitting to gauge on the stitches, I am not to gauge on the rows, so I am going to try to print the graph and knit so it works.